$100.75 million opening day results for the Iron Man flick helped boost Marvel's sales for the first fiscal quarter to $112.6 million, the company announced today. While sales are down over the same period last year when the company raked in $151.4 million, Marvel said Iron Man was the 10th best opening weekend ever and the second-best non-sequel film debut ever, second only to Marvel's Spider Man. 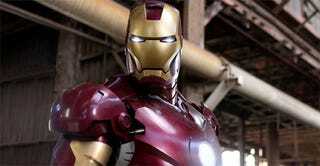 In total, Iron Man has generated about $201 million globally to date. Marvel will no longer be involved in direct toy operations, it said, to increase its focus on entertainment and licensing opportunities. The company is also looking ahead to its next three years of character franchises — including an Iron Man 2 film to be released on April 30th, 2010. Following the Iron Man sequel in April, Marvel will follow up with Thor on June 4th, 2010. Also up ahead? An "Avengers-themed summer," with two Avengers movies planned for May (The First Avenger: Captain America) and July of 2011 (The Avengers). The results announcement didn't reveal whether video game tie-ins were planned for the upcoming films — but it did show that they're working on a Spider-Man musical with music and lyrics by U2's Bono and The Edge. Marvel chairman Morton Handel said, "Marvel's self-produced feature film slate launched this past weekend with a performance that firmly establishes Iron Man as a major new film franchise, and the Company eagerly awaits the June premiere of The Incredible Hulk, Marvel's second self-produced film. In addition, Marvel has been investing in other important areas of growth such as the Internet where, to lead the Company's newly formed Global Digital Media Group, Marvel recently announced the hiring of Ira Rubenstein. Marvel has a strong foundation to build from, and the Company is adding infrastructure to maximize these opportunities."